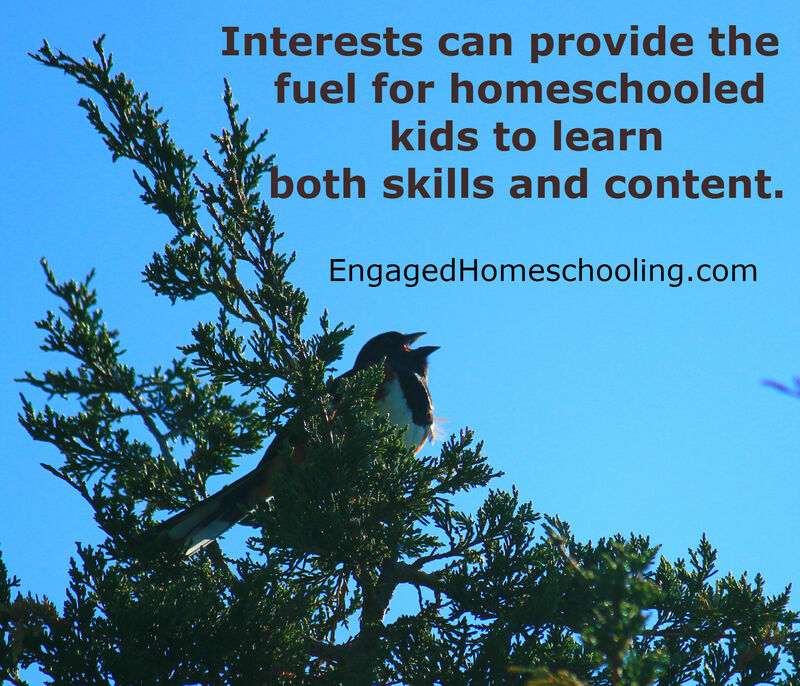 Many homeschooled kids learn both skills and content through their interests. By that, I mean their interests motivate them to learn both how to do things and information they should know. An early years child who is interested in birds might have his interests supported by his parents, who help him put up a bird feeder and keep it stocked with food. Together, they observe the birds and possibly think of more ideas to create a better habitat — adding water, shelter, or nesting materials. With parent and child learning at the same time, they can use field guides and binoculars to learn to identify the different species that come to the feeder. The parents can model keeping a “life list” of bird species they see and help a child create his own list. They can sketch the birds with colored pencils or take photographs for a scrapbook/notebook or upload them to a personal blog. Young children might dictate notes, original poems, or short stories they write about birds, which their parents add to the blog or notebook; slightly older children might put these writings in their own handwriting for a notebook, or work on keyboarding in order to update their blog with text all on their own. They can watch documentaries and read library books about bird migration, mating and nesting habits, and the types of environments that different species need to thrive. They can also explore humans’ fascination with the possibility of winged flight for people, talking about various inventions that failed and how the Wright Brothers invention ultimately succeeded — though with far from bird-like flight. They might study homing pigeons and their role in carrying messages during World Wars I and II. Depending on where the child’s interest goes as he gets older, the parents may find themselves supporting further and ongoing interest in birds — their role in the food chain, how birds of prey can be trained to hunt (falconry), how scientists theorize about their evolution from dinosaurs. The family may support parrot rescue/adoption, build bluebird nesting boxes, and take field trips to watch bald eagles or ospreys or hummingbirds. Parents may help the child participate in an Audubon bird count and review the national results, comparing trends to previous years. Over time, this interest may wane and another may take its place. The new interest might be related — such as another biology or nature interest, or it may be something entirely new, or the child may delve ever more deeply into ornithology. What did this child learn? Handwriting. Learning to copy Mom or Dad’s printed bird names for his own life list (just like a grownup’s! ), the child learned to recognize and print letters, and was motivated to learn them because he saw them as useful to managing his interest in birds. Composition. Nature and science notes added to a notebook or blog began the process of how to write nonfiction; poems and short stories inspired by bird study provided an imaginative roost for learning to write creatively. Observation. Sketching and photographing the birds helped to hone the ability to pick out detail and see the birds’ distinguishing characteristics and mannerisms. Research. Looking in a field guide to determine a bird’s species is a basic research skill. In my role as a homeschool evaluator, I recently worked with an elementary age boy who confidently used the index of his bird field guide to help him locate the pages with information about a bird he wanted to show me. Library skills. Picking out bird books from library shelves or using the online catalog is something that begins at Mom or Dad’s side, but becomes second nature as a child figures out how library books are grouped and classified. Reading. Reading those library books and field guides, as well as stories about birds, improves vocabulary, fluency, and comprehension. Construction. Building those bluebird boxes and bird feeders provides motivation for a hands-on project that involves planning and/or following directions, measuring, sourcing materials, and assembling. Statistics. Analyzing the trends present in the bird count numbers is an introduction to the usefulness of statistics and how to interpret data. Art. The child practiced sketching birds and using art media. Technology. The child practiced keyboarding, learned internet search skills, and learned how to blog. This entry was posted in Engaged learning, Interest-based learning, Tools of Engagement and tagged benefits of following student interests, bird unit study, engaged learning through interests, interest-based learning, interest-led learning, metacognition in homeschooling, passion-directed homeschooling, unit studies on April 26, 2014 by Jeanne Faulconer.